Here’s a house-warming gift that is sure to be well-received by anyone moving into a new home. Since you assemble the basket yourself, you can dress up the basket in a number of different ways, depending on the occasion and the taste of the recipients. 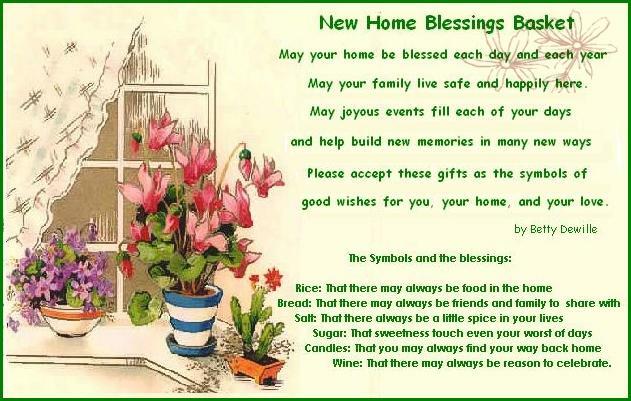 The basket features an assortment of products, each with their own symbolism of good wishes for the new home owners. We have created three printable poem scrolls to accompany the basket – just click on the thumbnail of the scroll that you like the best to access and print the full-size version. As well as the new home poem, each scroll also includes an explanation of the symbols represented by the main items in the basket. 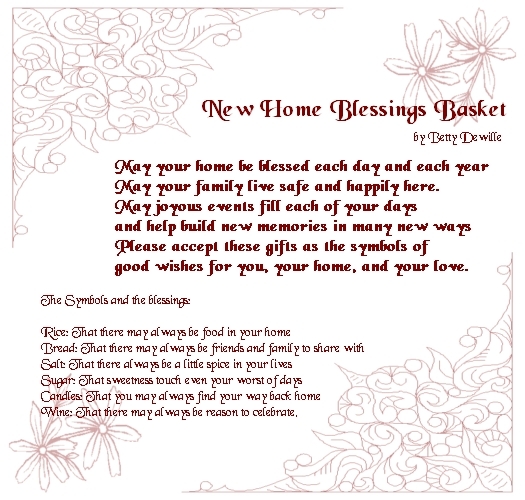 Nice additions to the home blessings basket include wine glasses, candle holders, assorted candles and fresh baked bread or a bread mix, although the only required ingredients are the ones listed in the poem. Lay crumpled tissue on the bottom of the basket to support the items; clear tape can help secure some of the pieces in place if needed. 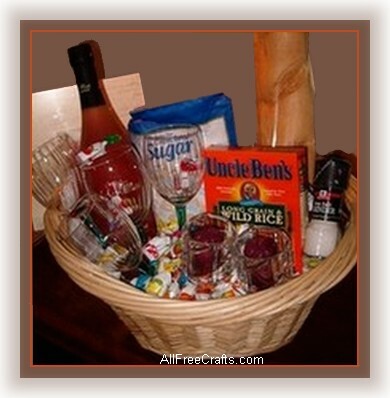 You could also line the basket with linen placemats and napkins and nestle the items on top. Wrap the basket in sparkling cellophane, and roll the printed poem into a scroll. 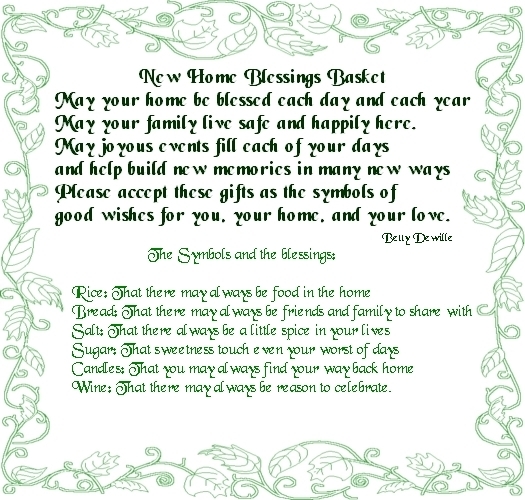 Tie the scroll with ribbon, then add it to the basket and your New Home Blessings Basket is ready for gift-giving. Hi there, I’d like to use your ‘blessing basket’ idea in a blessing book I am compiling. You would receive full acknowledgement of course. May I please have permission to use it?